Inspiration Mood Boards are crucial to every project we oversee. The first step with any project is to create a Mood Board that will help guide everyone involved and keep everyone on track. Sometimes creating these boards can take hours. Sometimes days. It’s important for us to be patient and pull together images that are intentional and beautiful. If you’re like us, one of the first places you’ll go for inspiration photos is Pinterest. But my goodness, there is SO MUCH out there, right?? It’s hard to narrow it down sometimes. Look for images that bring you joy. These images don’t have to be related to your wedding or the specific thing you are finding inspiration for. It could be an image of a plant or a fabric. It can even be an image of a meal. Look at the Pinterest Boards and websites of favorite interior design magazines (Elle Decor, Better Homes & Gardens, Veranda, Domino), fashion magazines (Glamour, Elle, Vogue), wedding magazines and blogs (Martha Stewart Weddings, Brides, Geraldine, Flutter, Once Wed, Style Me Pretty, Grey Likes Weddings, Inspired By This, 100 Layer Cake, Ruffled), and even your favorite Instagram accounts. Be specific with the search terms. Don’t just search for “summer wedding”. Be more specific. Type in something like “summer wedding dusty blues romantic” or “summer wedding vineyard bohemian” to see what comes up. Look at the other related images. When you find an image in Pinterest that you like, click on it, and scroll down to see similar images. You’ll likely find at least one more image that you like. Consider the venue and the location for the mood. If you’re planning a wedding at a vineyard, you’ll likely have a different mood than if you were planning a wedding at a barn. Consider the season. If you are getting married in the Spring (March-May), look for pastel colors, lavender, yellows, soft pinks. Look for ranunculus, peonies, lilac, sweet peas, and tulips. If you are getting married in the Winter (December-February), you’ll probably want to look for metallic colors, reds, whites, greens, and softer blues. The flowers for a winter wedding will have berries, branches, spruce, anemones, pinecones, and perhaps even some cotton. Whatever season you’re going to be getting married in, make sure you’re searching for terms that relate to that season. Look at all of the images you pinned in the original board from Step 1, and start narrowing it down. Look for the images that truly bring you joy. Pin those images to your new board. Aim for 15-20 images on this board. Take a step back and look at your new board. See what jumps out at you. What key words come to mind? Tropical? Vintage? Rustic? Shabby chic? Modern? Luxe? Write these words down so you can always come back to them when you’re making a design decision. Choose ONE main image in this new board that you absolutely love and feel like it truly represents the design, mood, and color you’re going for. Pull that image into a separate folder (or even a new Pinterest board). We like to save this image and the images mentioned in the next paragraph in a separate folder on our desktop. Now go back to your 2nd board and look for the images that really capture the colors or mood you’re going for, the ones you’re most drawn to, and the ones that align with that main image you just saved. Save these images in that same new folder with the main image (or the 3rd Pinterest board if that’s the route you took). Open up your word processing software (or Photoshop), and start a new one-page document. Do not do more than one page because you want this to be a quick reference for you and your vendors. Add your main image to the document first. Either place it in the center, near the center, or if you aren’t creating a perfect grid, make it the largest image. Then pull in other images for an overall vibe and mood. Remember: they do not have to be wedding images or interior design images! We try to aim for about 8-10 images on each of our Mood Boards, sometimes less than 8. As you add images, keep looking to ensure that the images relate to each other and complement that main image. For example, if your main image is light and airy, you don’t want a lot of moody, dark images on your board. Make sure you have variety (i.e., don’t have multiple photos of the same colors, same flowers, etc.). Make sure that your photos are all similar photo styles (look at the time of day, the lighting, the film type). And once again…don’t use only wedding-related images. 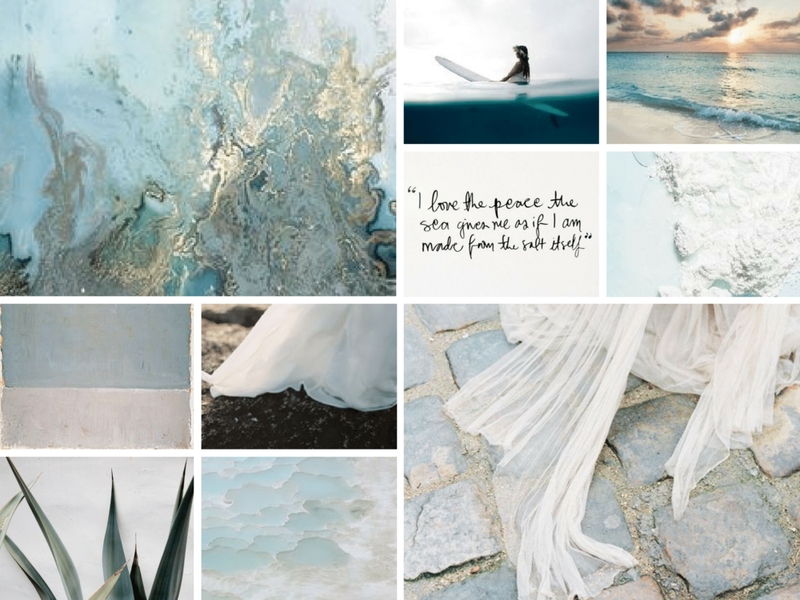 Here are some examples of some of our favorite Mood Boards we’ve created!